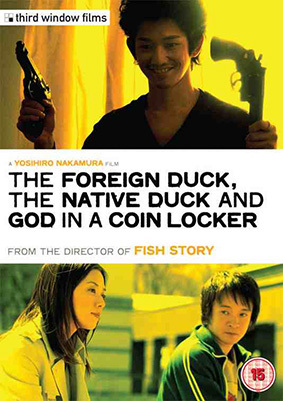 And wacky film title of the year goes to Nakamura Yoshihiro, director of Fish Story and Golden Slumber, both of which were preceded by the 2007 Ahiru to kamo no koinrokkâ, which has been translated as The Foreign Duck, The Native Duck & God in a Coin Locker, the sort of title that, like fellow Japanese filmmaker Miki Satoshi's Turtles Are Surprisingly Fast Swimmers, makes we instantly want to see it. Moving into his new apartment in Sendai, college student Shiina (Gaku Hamada from Fish Story) meets his new neighbor Kawasaki (Eita from Hara-Kiri: Death of a Samurai and Memories of Matsuko). Tall, confident Kawasaki and short, mild-mannered Shiina seem to be unlikely candidates for friendship, but they click over a mutual interest in Bob Dylan. The Foreign Duck, The Native Duck & God in a Coin Locker will be released on UK DVD on 11th January 2013 by Third Window Films at a yet to be confirmed RRP.